Trapped ions in linear Paul traps have been established as a powerful platform for performing experiments in quantum optics, quantum computing, quantum simulation, quantum control, and more recently in quantum thermodynamics. For the latter, modification of the trap geometry can facilitate the study of thermodynamic effects in the motional degrees of freedom. 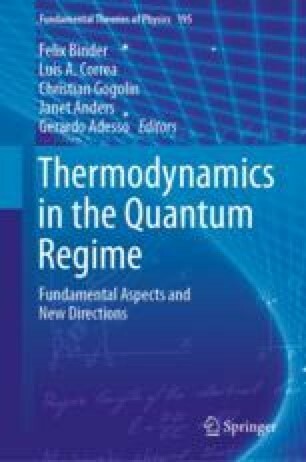 For instance, tapering the radial confinement of a trapped ion gives rise to temperature-dependent forces, where the definition of temperature is based on the concept of thermal states defined as an average in the time domain. It has recently been shown that such tapered traps can be used to realise single atom heat engines, where classical notions such as thermal reservoirs, heat transfer, work, internal energy, power and efficiency can be studied at quantum length scales. In this chapter, we introduce the tapered trap platform and present a basic description of it in the quantum regime. S.T.D. and K.S. acknowledge support from the German Research Foundation (grant Einzelionen- wärmekraftmaschine), the Volkswagen Foundation (grant Atomic Nano-Assembler) and European Union (EU) COST action MP1209. O.A. is supported by the Royal Society Newton International Fellowship (grant number NF160966) and the Royal Commission for the 1851 Exhibition. S.D. acknowledges support from the U.S. National Science Foundation under Grant No. CHE-1648973.